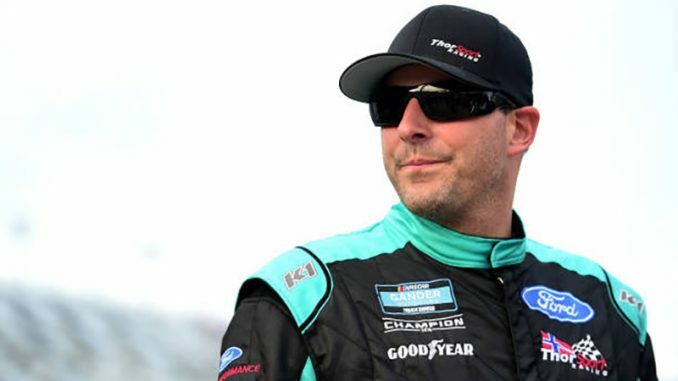 Johnny Sauter has an exceptional record at Martinsville Speedway, with four victories and a pole in 22 NASCAR Gander Outdoors Truck Series starts at the .526-mile short track. Sauter and Denny Hamlin who has has five Cup victories at the track feature similar backgrounds, learning their craft on asphalt short tracks, but beyond that, Sauter is at a loss to explain why certain drivers excel at Martinsville and others never solve the mystery of one of NASCAR’s most enigmatic venues. “I think for a lot of us, it’s similar to what we grew up doing,” Sauter said on Friday during a question-and-answer session with reporters at the speedway. “Our background has been around this kind of racing, or this type of atmosphere or whatever you want to call it. “I know it is for me. I’ve always been partial to short tracks. It’s fun. I’ve been fortunate to win at mile-and-a-half’s and Daytona and all those places, but when you win here, you feel like it’s a big feather in your cap. Sauter was eighth fastest in Friday’s final Truck Series practice, but his strength at the speedway typically manifests itself in long-run speed.